Kilkenny Arts Festival is Ireland's oldest multidisciplinary arts festival programming classical music, music, theatre & dance, street, literature, visual art, craft & family events to an audience of over 45,000. The Kilkenny Arts Festival is committed to the presentation of a unique, distinctive and inspiring programme in a range of artistic disciplines to as wide an audience as possible. Every year, for 10 days in August, Kilkenny comes alive with a feast of artistic entertainment for all at the city's oldest and largest non-profit festival. Underpinning the presentation of events is the commitment to bring work to Kilkenny that would not be seen outside the festival context and a desire to commission and produce new work from Ireland and abroad. 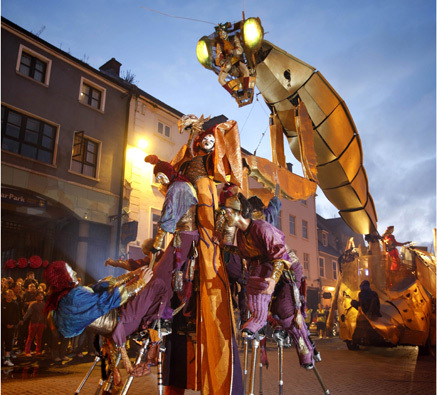 A world of artistic magic is in Ireland's medieval city, so come to Kilkenny, be part of the festival and experience the Arts in a way you will never forget! Contact us now to organise your visit while on your Ireland tours.